The Urban Arts Gallery presents “Star Wars / Heroes and Villains”, an collection of fan art from the Star Wars universe and beyond. Continuing an annual tradition, the May exhibit at Urban Arts Gallery features fan art from the Star Wars universe and beyond. This show invites local artists to submit art celebrating their favorite franchises from popular geek culture, such as Marvel, DC Comics, and other beloved sci-fi and fantasy titles. The result is always a diverse and delightful collection of artwork for fans of all ages. 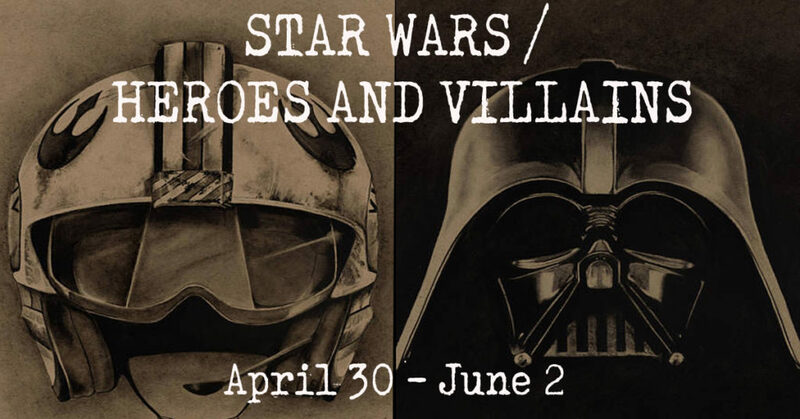 The exhibit will hang from April 30th to June 2nd, with an opening “May the 4th Be With You” reception on May 4th, as well as a gallery stroll reception on May 18th from 6-9pm. Admission is free and open to the public.